having bought every issue of Australian Muscle Car,i think it is a great magazine,it is obvious a lot of research has gone into the articles. However i feel there is too many articles on motor racing and not enough on road cars especially in this current issue. Perhaps it is time to produce two magazines.how about more stories of people and their road cars and less of the race coverages. Once upon a time, the best magazine available. I used to read it from cover-to-cover but of late the quality has dropped off. The editors and writers still consider modern performance cars as muscle cars, even though everyone knows the Australian muscle car era ended in the 70s. Putting a 4wd Kingswood on the cover pushed me over and edge and I probably won&apos;t be buying this magazine anymore, even though their coverage on the Falcon GT Nationals was a huge improvement from the last Nationals. They need to cover more grass root events like this, instead of pushing their own..
As informative and detailed as the mag is, have you guys considered the detrimental effect you guys have had on the market. Yes i buy every issue, and am an absolute car nut, and love aussie muscle over anything else. But tell me, how many young men and women can afford to own their own piece of history. I have a couple of aussie icons, I bought about nine years ago, after dreaming about them for most of my life, and can truly say bought them for the love of it, pure and simple. Your mag, and the similarly named web site over the last five years have seen to it that prices for such classics now escape mere mortals, and are only available to those who see them primarily as investments, and as automotive enjoyment second. You&apos; d think I&apos;d be over the moon at the way the prices as soared, but I&apos;m not really, lets&apos;s not forget who has been looking after these cars in the past, before the "johnny come lately&apos;s and the cheque book brigade" arrived, It was the normal bloke /woman, think about it! Congratulations on a great read,about time a magazine has come out with real reading material.For years the only mags available to a enthusiest were,wheels,street machine,etc.I personally believe that those to mags only focus on dribble drabble nonsenceabout joe blows fully sick what ever.Racing history,cars,tracks the drivers and people involved,the stories about the biggest races and names,all told and with such detail that you can almost smell the fumes in the air around the track and feel the excitment that the atmosphere of those events must have given off.Enough dibble,top mag,keep up the tremendous work. AMC is certainly my favourite car magazine at the moment and I&apos;ve been buying car magazines since the early seventies. Mark Oastler and his team do a great job and the information and obvious research that goes into each feature story is fantastic. I somehow managed to get hold of two copies of the first edition and I believe it is now quite a collector&apos;s item. Well done guys! You&apos;ve tapped into what the Aussie muscle car enthusiast wants whereas some of the other car magazines seem to have lost the plot along the way! Great informative magazine. However I would like to obtain back copy of magazine - late 2003 or early 2004 - with a production car race at Queensland Raceway (Ipswich) and which shows a Monaro on the front grid. It is green with gold stripes and has registration number PMN-273 on front grid. Could you help me out please as I have been unable to purchase this actual copy. Please reply email address and costs involved. If unable to assist could you tell me where I can purchase a copy. Thanking you very much. 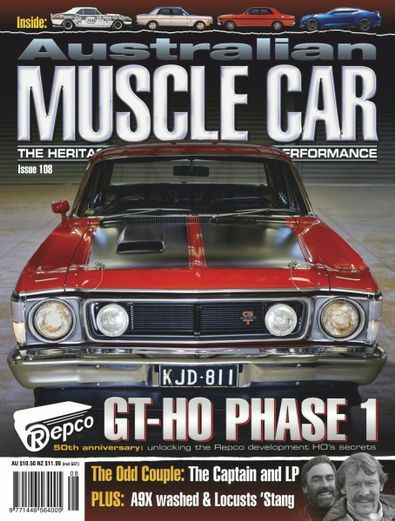 I have every copy so far, it is undoubtedly the most interesting read on the market, its scope of information is awesome from the history of the australian musclecar through to the current and future developments. better than street machine in my view. Undoubtably the most comprehensive magazine dealing with aussie muscle. This is the best read for any self respecting musclecar fan, in my opinion it&apos;s better than Street Machine.